Having the leash of an intelligent, majestic canine placed around your wrist for the first time is both breathtaking and terrifying. Think for a minute about an ADW assistance dog. These dogs are cared for like kings and queens. They are fed excellent food, groomed to perfection, and allowed to freely romp and play. They receive the highest quality of training, and are continually assessed and reassessed for their abilities. They are canine champions at the pinnacle of their performance. 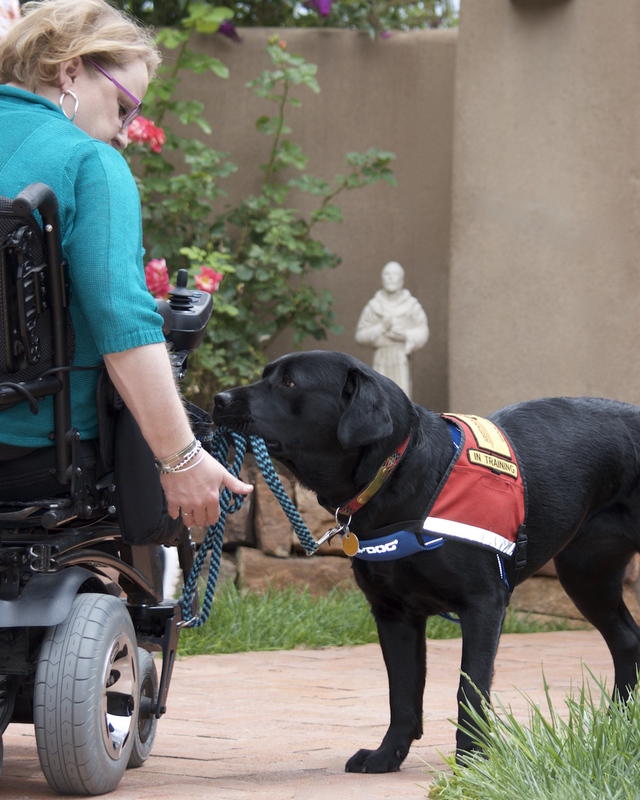 How do you match that level of canine perfection with someone who has a physical disability? How can one of these superior beings live alongside someone who has limited mobility like me? It’s overwhelming to try and understand why one of these dogs could want to spend 24 hours a day with someone in a wheelchair? That’s how I felt about Lovey when Jill Felice first put her leash around my wrist last May. How could I motivate her to care if I dropped my comb and couldn’t pick it up? Why would she want to lie by my side when I have to stay inside most of the day, sitting at a computer? I asked questions like these — how do I bond with such a grand animal? What can we have in common? What connects us? – every day that I attended ADW’s client-placement team training. So I followed the ADW instructors’ guidance and I tried not to question the process. I fed Lovey twice a day, brushed her coat, brushed her teeth, and gave her dog treats. I made sure she exercised twice a day and had clean water to drink. I checked her ears, dressed her in her backpack, and took her for regular vet care. Provided her with stimulating toys to enjoy. Praised her profusely when she performed a task. Honored Lovey for the intelligent and confident animal that I knew her to be. I discovered what motivated her and worked tirelessly to get her to trust me in the same way that I was learning to trust her. If you follow the process consistently, without even realizing it, you will transform into the person that your assistance dog always knew you could be – their pack leader. Your dog won’t even consider the fact that you have limitations. In her eyes, you are her champion and the only place she wants to be is by your side. Believe me, I couldn’t have understood it until I experienced it. It sounds so simple, but it boils down to perseverance and trust. It’s not always easy and there will be times when you want to give up. Lovey is my fourth dog and I can honestly say, this has been the uphill path that I have traveled with each of my assistance dogs before her. It is hard work yet Franz is exactly right, you have to snap out of it and keep moving forward. There will be moments of doubt and frustration. But to be in the presence of your assistance dog every day and to witness firsthand the love and devotion that she so selflessly gives to you is mind-boggling. Looking into Lovey’s eyes is like getting a glimpse into heaven.